A piece of Cleveland’s manufacturing history will be honored when the 1922 Mueller Electric Company factory building at 1587 E. 31st St. is transformed into Mueller Lofts—51 studio, one-, two-, and three- bedroom apartments in the heart of AsiaTown. 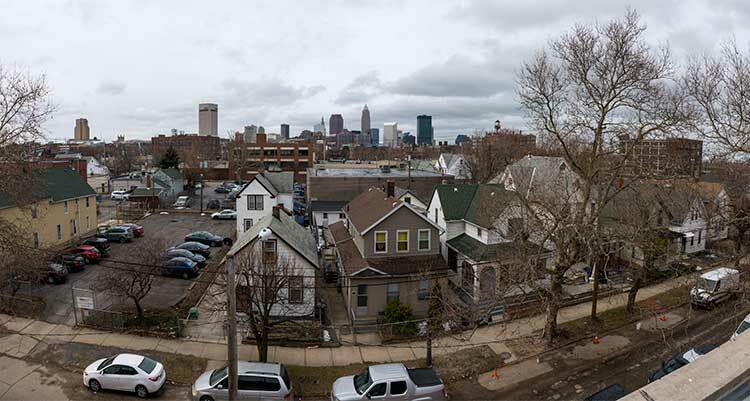 In addition to creating a new residential option in the neighborhood, the developers will offer residents a way to have a portion of their rents go back into the community via a volunteer program. Partners Josh Rosen, Naomi Sabel, and Ben Enzinga of Sustainable Community Associates (SCA) first bought the Mueller building in 2015. (The company is also know for transforming Tremont’s historic Wagner Awning building and the 1930 Fairmont Creamery building.) They then spent the first year stabilizing and exploring the structure before they received $1.745 million in state historic tax credits and $2.3 million in federal historic tax credits to renovate the factory, according to Rosen. Designed by architecture firm Bialosky, John G. Johnson Construction began converting the historic two-story building to Mueller Lofts last July. The first tenants are scheduled to move in on June 1, and the lofts are already more than 60 percent leased. The project will also embrace the rich backstory of the building. A little-known Cleveland invention milestone was marked in 1908 when Ralph S. Mueller and George Dusinberre invented what is familiarly known as the “alligator clip”—a simple clamp developed for use in electrical circuits—during a period when the electricity market was rapidly expanding. Today, a version of the alligator clip is used for everything from jumper cables to military applications to telephone line testing to roach clips for marijuana cigarettes. Mueller Electric Company thrived with this invention and built its factory and headquarters at the current E. 31st St. location in 1922. The company expanded alongside the electric power market, hitting its peak in the 1950s, 60s, and 70s. At one time, Mueller Electric was producing more than 125,000 alligator clips a day to be distributed internationally. In 2011, the company was sold to Desco Corporation, and the headquarters moved to Akron, where it still exists today. During its peak, Mueller’s assembly department was run by 48 women, who could assemble more than 85,000 clips in a day. “They needed people with small fingers to assemble the clips,” explains Rosen. Those features carry over into the apartments, which have high ceilings with original wood beams, large windows, vinyl wood plank floors, quartz countertops, stainless steel electric appliances, and washers and dryers in every unit. But SCA is also adding some modern living touches. On the first floor, there is an approximately 3,000-square-foot open-air courtyard in the center of the building, which will feature a large, gas-powered fire pit and locally-crafted wood benches made from timber repurposed from the building. Other amenities include a fitness center, a community screening room that can also be used for private events, dog wash station, and bike storage. Additionally, SCA is offering a unique program to residents. "For every five hours a tenant volunteers in a month, we will donate five percent of their rent to that non-profit,” explains Dill, adding that they encourage people to volunteer more hours, but five percent is the maximum donation. Volunteers can choose any non-profit organization that is within a two-mile radius of the building, Dill says, but SCA recommends MedWish, ASIA, Inc., Zygote Press, and NEON.